Preheat oven to 325°F. Combine cream and ginger in heavy medium saucepan. Bring to simmer over medium heat. Remove from heat; let stand 20 minutes. Strain cream into small bowl, pressing on ginger solids in sieve. Seperate eggs. Whisk yolks and 1 cup sugar in medium bowl to blend. 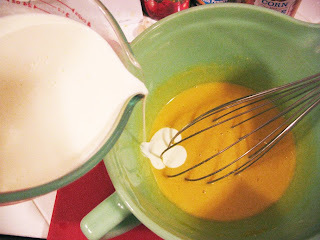 Gradually whisk in warm cream. 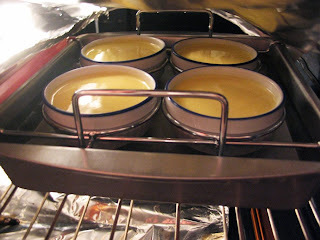 Divide custard among eight 3/4-cup ramekins or custard cups. Place ramekins in large roasting pan. Pour enough warm water into pan to come halfway up sides of ramekins. Bake custards just until set in center when pan is gently shaken, about 45 minutes. Remove custards from water bath; chill uncovered until cold, at least 3 hours. Cover and chill overnight. Sprinkle each custard with 1/2 teaspoon of remaining sugar. If you have a butane kitchen torch, use per manufacturer's instructions. Use a flame-retardant glove or oven mitt to hold the ramekin (or else set on a fire/heat proof surface). Caramelize sugar working tip of the flame from the outside in towards the middle keeping the torch in constant circular motion. Sugar should be golden brown. If burnt, let the sugar layer cool a few minutes than peel it away with a paring knife and begin again. May take a bit of practice, but WARNING: Torch is addictive! Torchless? No matter. Preheat broiler and place custards on baking sheet. Broil until sugar melts and caramelizes, turning sheet for even browning. 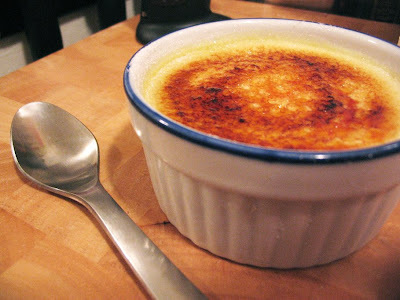 Serve immediately, or refrigerate custards until topping is cold and brittle, about 1 hour and up to 2 hours. Enjoy!